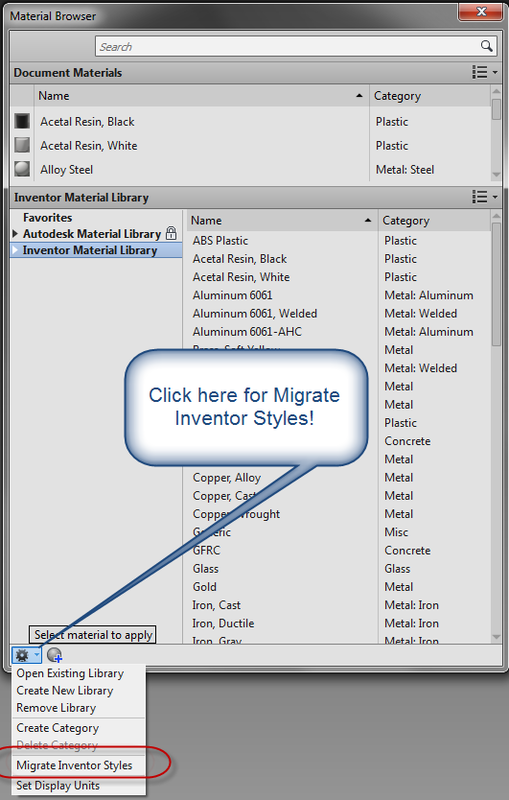 A new change in Autodesk Inventor 2013 is how materials and colors are handled. 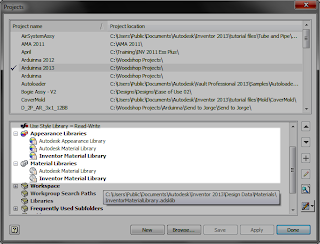 Instead of being a part of the Styles and Standards libraries, like in previous versions of Inventor. Now, they're stored in Appearance Libriares (for colors), and Material Libraries (for materials). 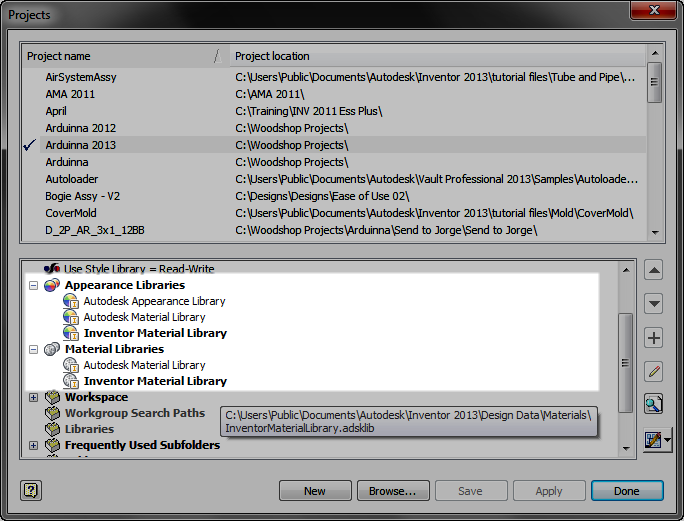 The location of the new libraries can be seen by looking at the project file. But what if there are old libraries that have been created over time? We wouldn't want to throw them out and start over right. So there has to be a way to migrate them, right? Well, of course there is! (or else I wouldn't have anything to blog about). But how are the libraries migrated? There are two places to access the Appearance and Materials Libraries. The first is from the quick access toolbars. The second, off the Tools Ribbon on the Materials and Appearance Panel. Choosing either icon will bring up the browser for that particular library. 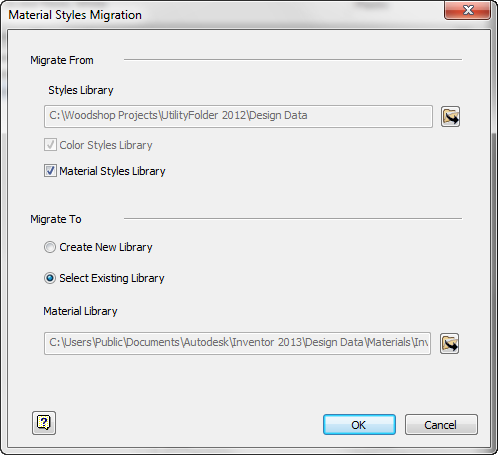 Migrating to both the Material and Appearance Libraries is a matter of clicking on the "gear" icon in the lower left hand selecting "Migrate Inventor Styles". The dialog for Materials. The Appearance dialog is nearly identical. The source (the library to be migrated) is selected, followed by the destination library. 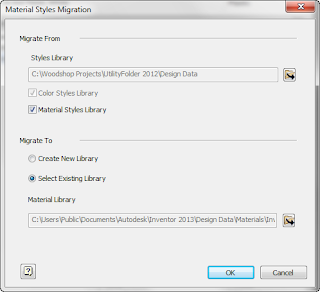 However, there are two destinations to send your migrated folder, one is to create a new library, the other, select an existing library. There's two theories. One is to migrate your old libraries to a newly created one, and remove the old Inventor libraries. This makes sure you have "one truth" for those materials. The other, is to merge them into the existing library. The important, custom materials will be there. Which did I choose? Personally I used "Create New Library. For me, it was a little easier to have that "one version" of the truth. I can remove one library later if I don't want it. Hit okay, and the migration begins. Soon, the migrated Material Library is complete. The best part now, migrating the Color Library to the Appearance Library. Why is it so good? It's basically the same steps! If you've done the Material Library, you can do the Appearance Library. Naturally, it wouldn't be a blog post without a video. So here we go! Do you have input on how you might have migrated your own libraries! Throw a comment below! P.S. 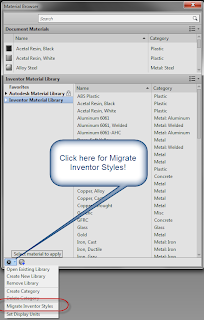 If you're interested in how to migrate Dimension Styles, Sheet Metal Styles, etc. Check out last week's blog here! Thanks, I'm not sure how the video got stripped out, but it should all be fine now! Hi, when i do this it works but when i shut down inventor and restart the library dissapears, what can i do to stop this. I'm afraid I haven't had any issue with my libraries disappearing, so I can only speculate why yours might be doing it. You might make sure your on the latest service pack (SP2 as of 20-September-2012). I'd also suggest adding custom libraries in the project, and see if that helps them "stick". I have created a material library and appearance library for my project. I have picked few colors from inventor database and added to the created appearance library. I have assigned specific color from created appearance library to a specific material. 1) But, the same is not reflected when change the material to a part. In order to change the color (appearance property), again i have to pick from the appearance drop down menu. If so, what is the use of appearance in material library. 2) I have made many categories in material library which are not visible in GUI, when i tried to select a material. If so, what is the use of category during the creation of material list for a project. 3) I am getting for warning message: "The material ---- was missing the appearance asset. A default appearance asset definition will be applied if you continue. Do you wish to continue?". After this, I could not able to see appearance field in the material properties at all. If so, how to bring the appearance field back as a material property. It sounds like you have a lot more going on than I can solve in a blog comment I'm afraid. I suspect that the custom libraries aren't configured right. Perhaps they're not referenced in the project, correctly. My thought is that if that's solved the rest will fall into line. Autodesk did put out a document a while ago. This may also help as it gets into a lot more detail than I did. I have created material library and assign materials to project -A part files and the standard used is ASTM. Now, for other project - i have to go with BS standard.So, how can I replace the earlier materials which are of ASTM to BS ( I need one to one replacement). Rest entire model remains same. If you're trying to replace materials on components (swap a ASTM steel with a BS steel, for example), the only way I would know to do it is to make sure both libraries are available to the project. You should then be able to swap them in the Bill of Materials in the assembly. I'm sure it could be done via some sort of customization, but that may be more time consuming than manually swapping, depending on the circumstances.